Yesterday evening we were in Toronto for the Marcus Roberts concert at Koerner Hall. As we passed the stadium on Bloor Street where there was cheering from the sport field. We initially wondered what game was being played: could it be football or soccer? Then we saw a disc fly through the air and teams of men chasing it to the far end. It was a frisbee game! The world of frisbee turns out to be 'ultimate disc'. In frisbee soccer, you are not allowed to run with the disc, but the disc is allowed to touch the ground, or roll along the ground. Once the disc is on the ground, either team may pick it up, but maintain the non-contact rules, so once a player has picked it up, their marker must retire 1m away. If two players pick up the disc simultaneously, then the offence retains possession. The game can be played on a soccer or football field, or a similar field set out with cones. Score by throwing the disc through the goalmouth. Modify the number of players to suit the field size. - See more at: http://www.diego23.com/other-frisbee-games/#sthash.8wP7NMTB.dpuf"
And then again, it would be easy to be mistaken. given all the games that are now played with an ultimate disc. They are here at reddit.com. 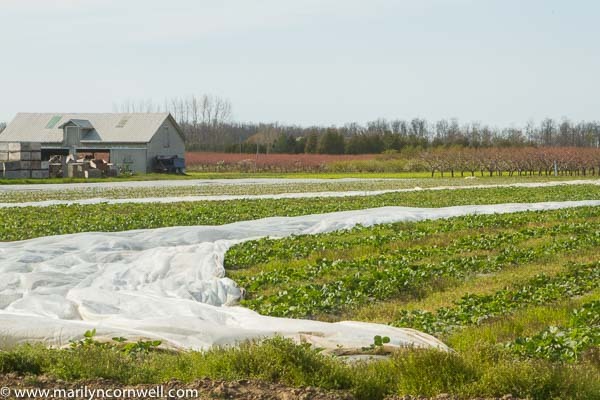 Back in Niagara, our picture is a vast strawberry field with the protective frost cover blowing in the escarpment breezes. Asparagus is here at the market, and strawberries will follow soon.